A 3 1/2 hour hands on cooking class culminating in dinner with wine and beer. Learn about essential Indian spices, special ingredients and unique cooking techniques while we make some of Simran’s favorite family recipes. 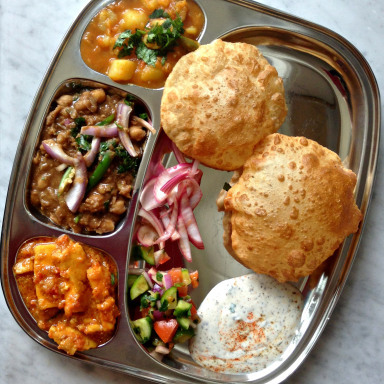 Together we’ll cook a vegetarian feast: golden, puffed pooris, a trio of vegetarian curries, and some classic accompaniments. When served together, the dishes on this menu would be a typical Sunday family lunch in Northern India’s Punjab region, but each of the dishes on their own makes a wonderful addition to your home cooking repertoire.